Those thoughts and questions have been floating around in my head for a while now and it is interesting to see how, since 2010, they have evolved and developed. New Forms of Learning: How to Participate in a Conference 2.0 Style? 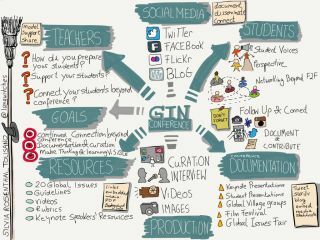 As part of the AASSA team, I will be traveling to the GIN conference (Global Issues Network.) being hosted by Asociacion Escuelas Lincoln in Buenos Aires, Argentina. My job, as the Social Media Coordinator, will be to “cover” the conference. I will be tweeting, blogging and documenting the work, collaboration, vision and learning taking place during the three days in Buenos Aires. The job of a Social Media Coordinator at an educational conference (for teachers or students) is a new concept. I am sure that many participants and even organizers are not quite sure what my role is about? One goal is to share resources and what is going on with students and schools who are not physically present in order to connect them and their projects. The documentation part is also at the forefront to make sure that the conference workshops, film festival and connections made do not end and are not limited to the actual days and people present. How will students take back what they learned, created and planned? How will what happens AFTER the conference be shared and connected? How can teachers model for, support students and share their own unique perspective of the conference with students and other educators? How do teachers prepare their students to be successful participants at the conference? How can teachers support students at the conference? How will teachers help connect their students beyond the conference with other students, experts, organizations and a global authentic audience? Students contribute their unique perspective. Students start building a global network beyond a face to face network. Students see an amplified vision of an “awareness-research-learn-present-action” process that does not end with the end of the physical conference, but continues to play a significant role with follow-up documentation and connections. What are some other considerations and examples for educational conference documentation? How do we answer the questions I started out with? How do we transform traditional conference experiences through Social Media, documentation and archiving? How can physical conference learning experiences spill over into asynchronous learning over geographic distances, time zones and time periods? How do we produce conference archives (as part of a crowdsourced effort) and conference (Institutional) memories?